We go to a hospital's emergency room in a complicated state of mind. In addition to being injured or ill, we are scared and confused. Most importantly, however, we are dependent. When we walk in that door, we put our own experiences and everyday knowledge aside and we trust in the experience and knowledge of the physicians and health care professionals to take care of us or a loved one. We have all heard of a heart attack and stroke. We all know that an aneurysm can be life-threatening. But we also realize that we are not in a position to diagnose and treat ourselves or our loved ones. We understand that when a medical emergency is upon us, we don't have time to do our research and select a doctor based upon credentials or past success. We must put our complete trust into the hands of a complete stranger. Of course, most of the time, the medical personnel do everything in a timely and proper manner. Sometimes, despite the very best medical care, death is unavoidable. However, sometimes the medical professionals fail us. When this happens, the results can be devastating. The emergency room at a hospital is a stressful place not only for the physicians and medical personnel but also the patients. It is a very fast-paced environment that requires a sharp mind, the ability to multi-task, speed, and proper training. There are regulations in place to protect the injured and the ill. Hospital physicians, nurses, and other medical personnel are charged with following a certain emergency room protocol to ensure that mistakes are avoided. They have a duty to treat medical emergencies in a certain way and when they fail to do so, they may be held liable. While each hospital implements its own individual goals and standards, there are some federal and statewide mandates as well. A hospital is required to evaluate and treat time sensitive matters, such as potential heart attacks and strokes, within a certain time frame. If a patient presents to the ER with symptoms of such emergencies, that patient is to be given priority. Also, hospitals are not permitted to turn down patients without health insurance if they are experiencing a medical emergency. For example, if a pregnant woman arrives to the ER in labor but she does not carry health insurance, the hospital must treat her. Even with such regulations in place, we still see medical mistakes. Inadequate facility to treat common conditions. 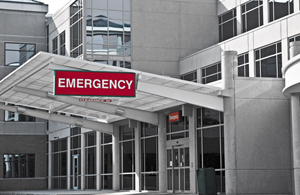 Emergency room medical errors can result in varying degrees of harm. The error may lead to a misdiagnosis, a missed diagnosis, ongoing harm, lack of treatment, unnecessary treatment, and even death. When medical personnel fails to properly treat a patient, the harm can be evident immediately or may not be known until after the patient is back at home. Tapella & Eberspacher has handled countless emergency room medical errors cases in both Missouri and Illinois. Failure to take a complete patient history. We all realize that sometimes there is simply nothing the emergency room doctors can do for us. Sometimes, despite their very best care, we are left with an unfavorable outcome for us or our loved ones. But when a hospital makes an error based upon one of the above examples, it is medical malpractice. Such mistakes are not supposed to happen. If you or a loved one has fallen victim to a medical error in the emergency room, you may be entitled to compensation. Please contact the lawyers at Tapella & Eberspacher for a free consultation in our St. Louis metropolitan office at (618) 628-3800 or our central Illinois office at (217) 639-7800.